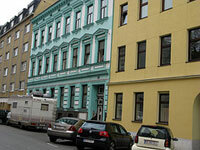 The 15th District, Rudolfsheim-Funfhaus, is an inner-city area not too far west of the Vienna city centre. There is plenty of cheap housing here, bringing in a large population of immigrants, mainly Turkish and Albanian. In recent years, Rudolfsheim-Funfhaus has become known for sensational crimes, drug trafficking, and prostitution. For the most part, the district's housing conditions are shoddy, with many of its cheap apartments even lacking such basic amenities as indoor bathrooms.